Trump has a dilemma. He has to take some executive action that will allow him to ridicule President Obama and show that he is punishing Cuba for its human rights violations and the confiscation of businesses and property after the revolution, but not harm US telephone companies, hotel chains, airlines and cruise lines. Trump is expected to announce his Cuba policy next Friday in Miami. There can be little doubt that he will reverse some of President Obama's executive orders in order to brag to his base supporters and try to make the Cuban diaspora hardliners happy. He will say the President was weak and made a terrible "deal," which the world is ridiculing. He may even take yet another shot at Hillary Clinton. There are some things that I bet he does not say. He will not compare Cuban human rights with those of his friends in Turkey, the Philippines, Saudi Arabia, Russia, et al. and he will not mention that he is lending credence to the tired claim that the US is the Evil Empire that is responsible for Cuban economic problems. He probably won't note the unpopularity of his action in Latin America and I don't expect him to say much about the security implications of alienating Cuba at a time when Russia, China, and Iran are moving closer either. (Someone should tell him about the Cuban missile crisis). But, I can't imagine that he would do something major like break off diplomatic relations or do anything to harm the tourism and travel industries. That would hurt our economy, cost jobs and be unpopular with the general public which favors lifting the trade embargo. By and large, the Cuban Internet is constrained by political/power considerations, tired political rhetoric and mistrust, the cost of infrastructure, the bureaucracy and economic interests of the ETECSA monopoly and Cuban government bureaucracy, not US policy. But, what Internet-related changes might Trump reverse? During his first hundred days, President Obama "reached out to the Cuban people” (emphasis added) by easing restrictions on remittances, family travel and gifts. Increased remittances and gifts meant more Cuban people had laptops, tablets and smartphones to use in public access hotspots and access rooms as well as the money to pay for time online. Reversing these changes would deny ETECSA Internet-access revenue, but it would harm Cuban citizens with family abroad and give the government anti-US talking points. I will be surprised if Trump reverses these changes, but that does not mean he won't do it. Cutting roaming would hurt US tourism and telephone companies — it is hard to imagine Trump doing that. He might be willing prohibit Americans from buying phone and data minutes for Cubans — that would only hurt Cuban people and payment services like Ding.com (an Irish company). While US companies have permission to sell communication equipment and infrastructure to Cuba, I am not aware of any significant sales. Since China has dominated the Cuban Internet infrastructure market, stopping infrastructure sales would have little or no immediate impact, but it could become significant next year when Miguel Díaz-Canel, who seems to be pro-Internet, replaces Raúl Castro. The FCC removed Cuba from their exclusion and reversing that might cause Google to remove their Cuban caching servers. If that were to happen, there would be little practical impact, but it would be symbolically significant. President Obama also moved to allow US citizens and companies to pay self-employed Cuban entrepreneurs for software and services as long as they were developed by self-employed entrepreneurs. I don't know the extent to which this occurs, but it is hard to see what would be gained by trying to stop the practice and who would be pleased to see it happen. I doubt that he will roll this one back. A number of organizations and universities have sponsored conferences, training courses, hackathons, etc. in support of Cuban software entrepreneurs. I am not sure whether Trump could somehow block that sort of activity, but I cannot imagine why he would do so. How about attacking President Obama's trip to Cuba? During that trip, he addressed Cuban entrepreneurs and announced a couple of concrete commitments, but they have all fizzled. Trump may point that out. Trump has a dilemma. He has to take some executive action that will allow him to ridicule President Obama and show that he is punishing Cuba for its human rights violations and the confiscation of businesses and property after the revolution, but not harm US telephone companies, hotel chains, airlines and cruise lines. It does not seem that reversing any of President Obama's Internet-related changes will achieve that end. Steve Bannon may be able to come up with some ideas, but, if he can't, I have a suggestion. One of the properties the Castro government seized after the revolution was the Riviera, a waterfront hotel and casino that is now run by the Cuban government. The hotel was built by the gangster Meyer Lansky and Lansky's grandson, Gary Rapoport, has claimed it. 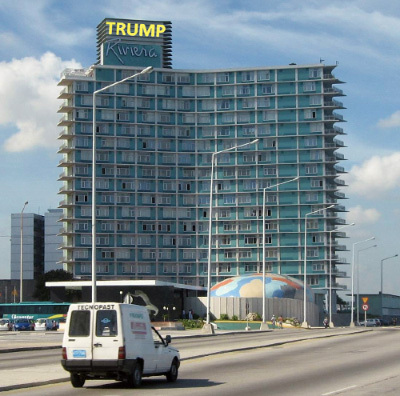 Perhaps he and Trump could work out a deal with the Cuban government, rebranding it the Trump Rivera. The initial announcement of this was removed from the Whitehouse.gov Web site, but it was captured by the Internet Archive and is also on the Obamawhitehouse.gov Web site. Local Time: Tuesday, April 23, 2019 05:44 AM PDT – Page Load: 0.3155 Sec.